The word on the street is, kombucha tea! The popular beverage is on everyone’s lips, winning over the masses thanks to its healthy, fizzy and refreshing properties. Not limited to store shelves, the drink can even be made at home, making it a convenient choice for many. It’s no wonder then that Kombucha tea is said to be USA’s fastest growing functional beverage. For the uninitiated, Kombucha tea is a fermented beverage, made by adding a symbiotic culture of bacteria and yeast (SCOBY) to a solution of tea and sugar. If you’re wondering how to make kombucha tea at home, follow the steps given below, and you’ll be good to go! A fermented tea beverage to boost your overall health! To make kombucha tea, bring 1 gallon of water to boil (or to the recommended temperature for the type of tea as may be mentioned at the back of the tea container). Once boiled, pour the water over the tea leaves. If you are using tea bags, dip them in the boiled water. Allow it to steep for 3-10 minutes. Note that this will again depend on the type of tea. Remove or strain the tea from the liquid. Thereafter add 1 cup of sugar into the tea and let it cool till it comes to room temperature. Add the SCOBY and 1-2 cups of the starter liquid, which is either from the previous batch or an original flavored store-bought Kombucha. Cover the mixed concoction with a cloth and secure it with a rubber band, so as to not allow it to spill. Store the Kombucha in a warm place, away from sunlight. Now, be patient and wait for it to ferment, which usually takes 7 to 21 days. Once fermented, its ready for consumption. Enjoy the tea and note that a person is not recommended to have more than 4 ounces of the tea in a day. 1.) A lot of people don’t know how to tell if their Kombucha tea is ready. The answer is simple: The tea should be tasted. Since everyone’s palate is different, some will prefer it sweeter, while others will want extra bubbles. Bottom line is that it’s a personal choice, so experimentation is encouraged. Eventually, the perfect brew will be achieved! 2.) Once the process has been mastered, it’s time to get creative! Adding passionfruit or mango will create a tropical Kombucha while adding cinnamon, cloves, and fresh apples will make an unforgettable holiday beverage. Incorporating some grated ginger is also a great way to add a nice “tang” to the sweet drink. 3.) The Kombucha possibilities are almost endless, so creativity doesn’t have to end at the basic recipe. 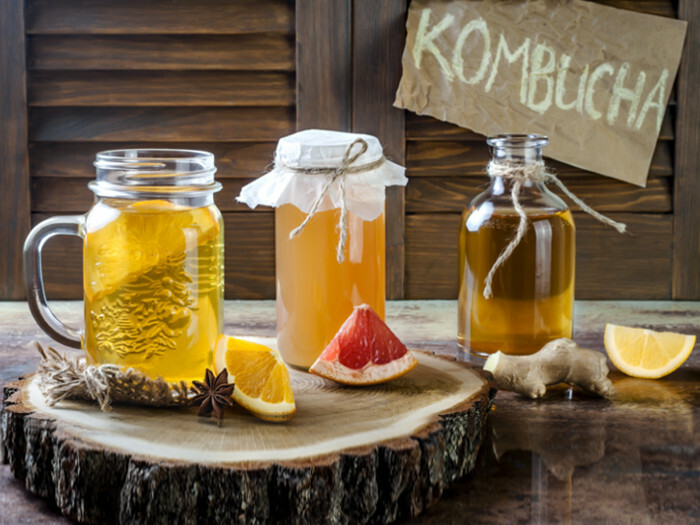 Kombucha can be used as a healthy alternative to sugary soft drinks and high-calorie alcoholic beverages. In the summer heat, a glass of kombucha on ice will really cool things down. Kombucha cocktails and mocktails can also be added to the dinner party menu, delighting guests with its enjoyable, sweet taste.